Dumpling. That's probably my favorite word in the whole entire world. It encompasses so many possibilities of flavors, textures, cultures, and more. It speaks of comfort and temptation. I can close my eyes and picture my happy place, and I'm surrounded by them, piles and piles of delicious dumplings in all shapes and sizes. I'm a little obsessed. This is no surprise. I've shared countless recipes and photos of dumplings over the years on this blog, I've celebrated National Dumpling Day and Chinese New Year even though I'm not Asian, nor did I grow up eating traditional dumplings. My home-grown dumpling comfort came in the form of manti, and it has only grown from there. I own no less than 5 cookbooks completely devoted to the subject, as well as several others on broader topics that include varied dumpling recipes as well. It's my religion. I love them. 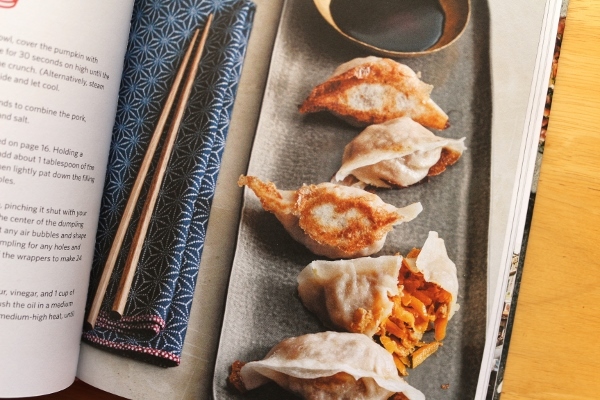 So it should come as no surprise that when a new dumpling cookbook is being released, I'm all over it! 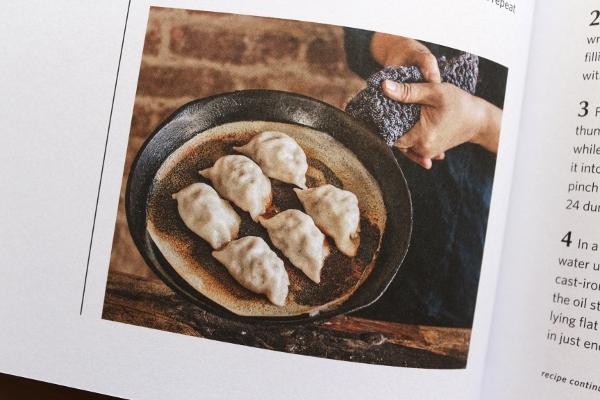 The Dumpling Galaxy Cookbook features recipes and insights from Helen You, owner and chef of Dumpling Galaxy in New York City's ultimate Chinatown located in Flushing, Queens. I have taken many trips on the 7 train to Main Street station in Flushing to quench my dumpling craving, but have not had the pleasure of visiting Dumpling Galaxy. I will certainly add it to my list for my next visit! The book is kind of adorable, using imagery of planets and imaginary dumpling-inspired constellations throughout the book's design to play on the galaxy portion of the book and restaurant's title. Helen hails from Tianjin in Northern China, which boasts dumplings that vary in style a bit from some of their more Southern counterparts. 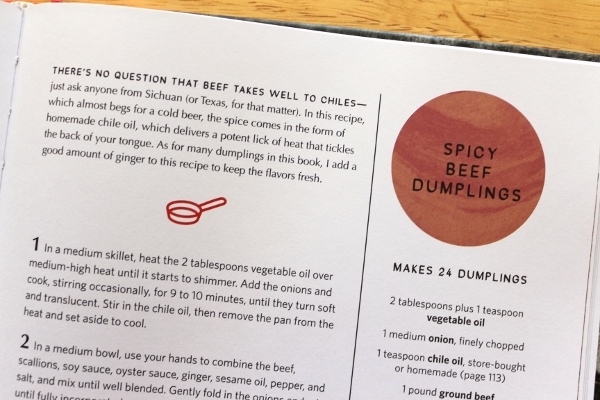 I definitely notice some differences immediately when I read through recipes and notations throughout the book. 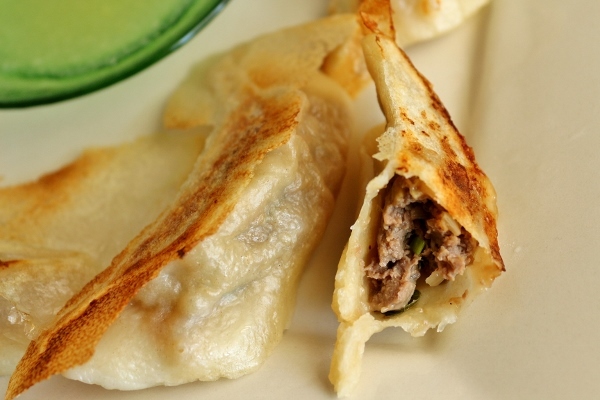 The first variance occurs in the recipes for the dumpling wrappers. 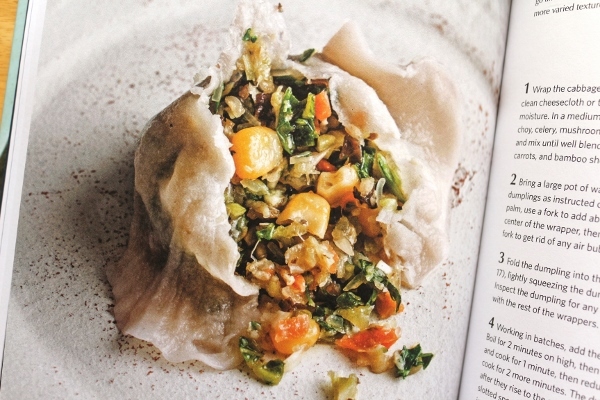 All of my other dumpling books feature a basic wrapper recipe (with some variations for different dough colors) using only flour and water. Here, the recipes differ slightly based on cooking style. 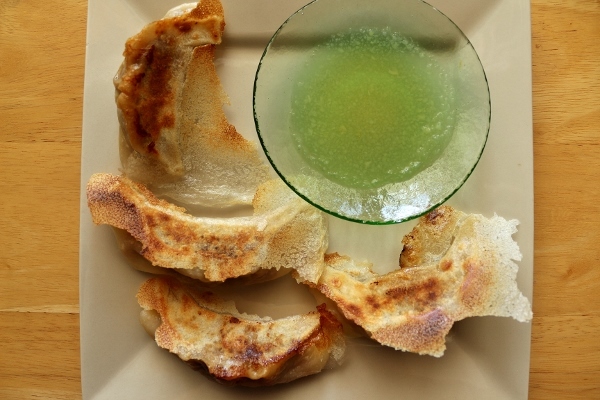 The dough for boiled and pan-fried dumplings both include a bit of salt and an egg white, while the steamed version is simply flour and water. 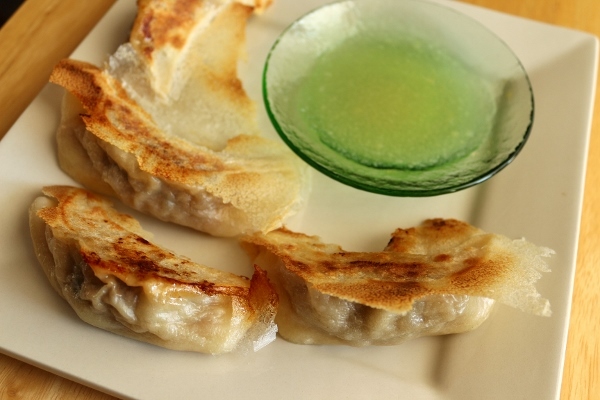 While I'm very comfortable making dumpling wrappers from scratch using my tried-and-true recipe, for the purposes of this review I decided to go with it and try the version using the egg white and see how it compares to what I've made in the past. Shaping the dumplings is also a bit different, and is much more simplified. 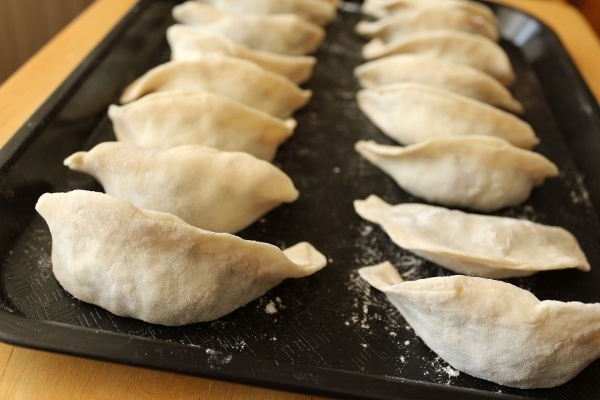 While there are tons of different ways to shape and pleat dumplings, Helen includes two very basic techniques which will probably be a relief for dumpling novices in particular, and certainly a time-saver for anyone making dumplings from scratch. 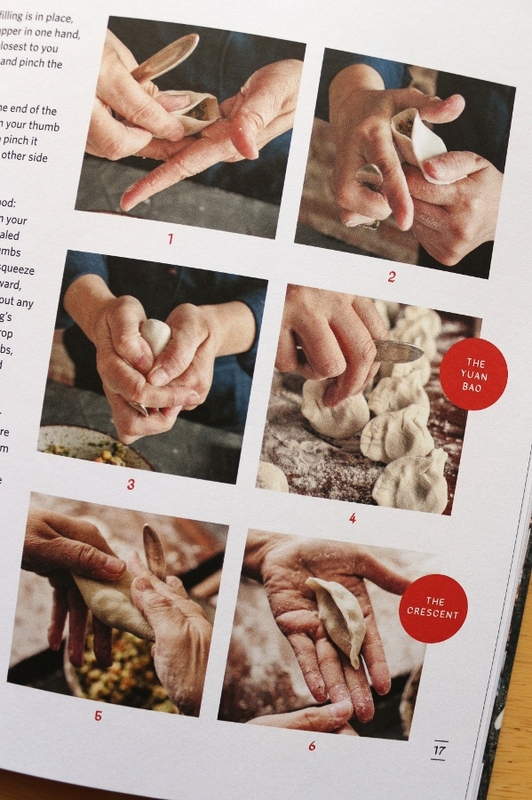 There's essentially no pleating involved, but rather pinching and sealing, and using your hands to manipulate the dumpling into the appropriate shape. Reading through more of the recipes, I was a little surprised to see Helen's use of sweet cooking sherry in place of what I've grown more used to in dumpling recipes, a traditional Shaoxing rice wine, but alas Helen has an explanation for this in one of her recipe notes. Shaoxing wine is more traditional in Southern China and is not really used in Northern China, where she grew up. So using the sweeter sherry is a more appropriate choice for her slew of dumpling recipes. 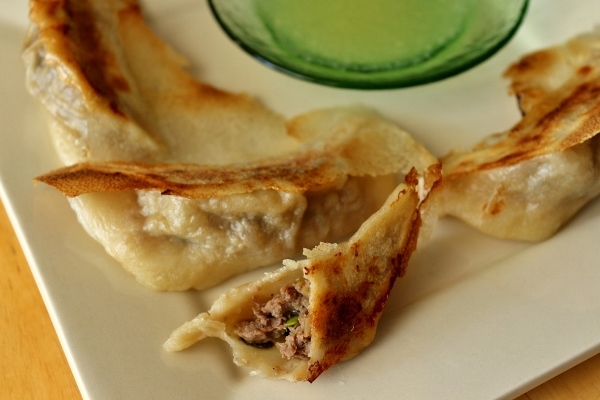 Even with years of dumpling-making experience under my belt, I learned something new about regional Chinese cooking that I can now use in my dumpling adventures. 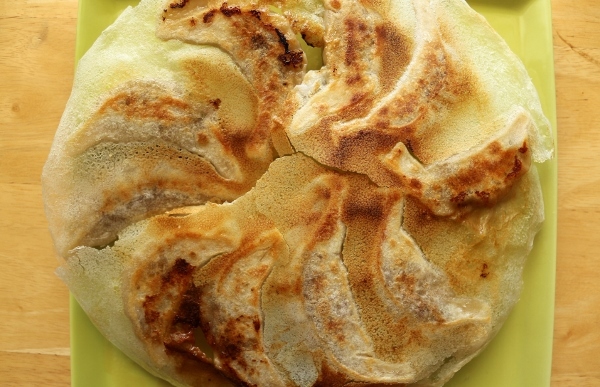 Her technique for cooking pan-fried dumplings is also a bit different, and finishes the process with a slurry instead of plain water for the pan-steaming process. This results in a thin and crispy crust in the bottom of the pan. I'm sure you could pan-fry the dumplings either way depending on your preference, but super crispy dumplings are my absolute favorite, so I'm definitely on board with trying this out. Recipes range from classics to vegetable based recipes, creative variations as well as desserts, and finally a chapter devoted to sauces, sides, and a handful of Northern Chinese specialties to serve with your dumplings as desired. 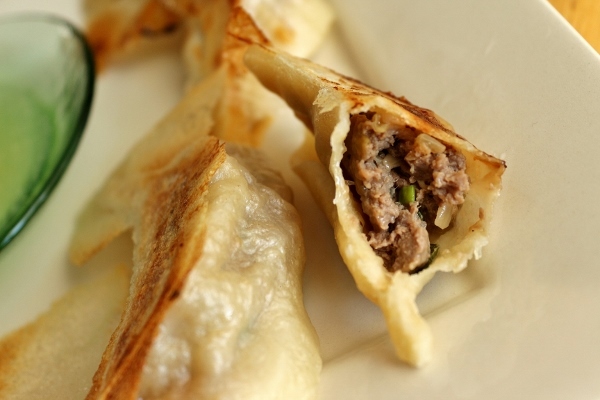 Some recipes that are particularly enticing to me include Pork and Mushroom Shumai, Eight-Vegetable Dumplings, Pork and Pu'er Tea Dumplings, Chicken and Broccoli Dumplings, and Crab and Chive Dumplings. One recipe in particular stood out to me as perfectly appropriate not only for the upcoming Chinese New Year celebration, but also convenient timing for any and all NFL playoff viewing opportunities. The intro even comments on pairing it with an ice cold beer. 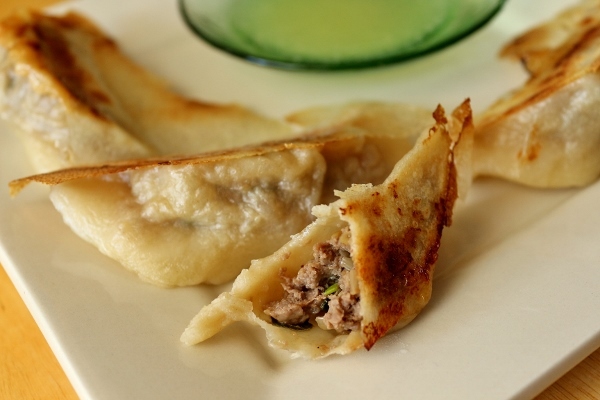 I'm talking about the pan-fried Spicy Beef Dumplings, infused with a combination of chile oil and fresh ginger and balanced with a bit of sauteed onion, scallion, and sesame oil among other aromatics. The spicy beef filling is incredible. The smell alone will make you drool, even before cooking it or tasting it. I'll be honest, I struggled a bit with this dough recipe. I prefer weighing ingredients if given the option, but was not offered any weights and decided to stick to the recipe and just use the volume measurements (even if I could technically convert it myself). The 2 cups flour to 3/4 cup water and 1 egg white yielded a VERY wet and sticky dough. I added probably an extra 1/2 cup of flour little by little and worked it into the dough to yield something I could actually work with and knead. Even then, the dough was still pretty soft compared to other dumpling dough I've made. The other recipe I usually use also calls for 2 cups/10 ounces and so I weigh out the 10 ounces and mix it with 3/4 cup water. Adding 3/4 cup water PLUS an egg white increases the liquid, and if the flour is measured differently from person to person (some pack more into the measuring cup than others) it will yield varying results. I managed to balance it out with some extra flour in this case. It was certainly fixable, but just something to be aware of. The recipe is supposed to yield 24 wrappers and thus 24 dumplings. I divided half the dough into 12 pieces, but found these dumplings to be sloppy and frustrating to assemble because the dough was quite soft and the wrappers were really large compared to what I'm used to. The edges actually flopped over (again, this is probably because of the softer than usual dough). For the other half of the dough, I divided it up into 16 (which would have yielded 32 dumplings if I had done this for the whole batch). This is more in line with the size dumplings I usually make, and the result is a lot neater and more composed looking. This is perhaps more of a personal preference, but I do think the slightly smaller dumplings are just easier to assemble, and even with the slightly softer dough I didn't really have any challenges with this half. Onto cooking the dumplings! As I mentioned earlier, Helen's technique of adding a slurry is a bit different than the way I normally pan-fry my dumplings, but I was intrigued and followed her instructions (with the exception of cooking more dumplings in one slightly larger pan than she specifies--10 versus 6). I cooked mine a bit longer than the recipe states to ensure a nicely browned bottom, but otherwise found this to be a great alternative to what I've done in the past. 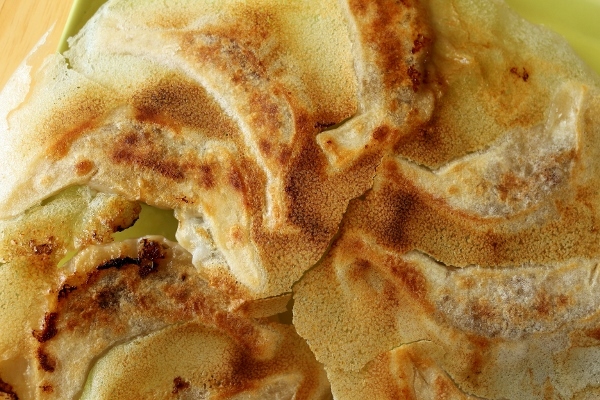 The thin and crisp pancake is a treat! It still feels like a bit more work than my other method, but it's a fun presentation. It's finally time to eat! 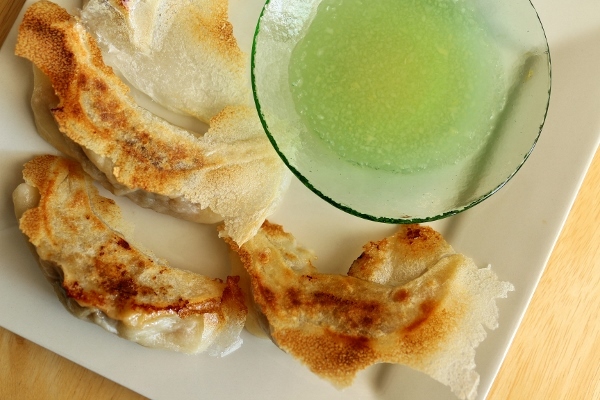 And oh my gosh, are these dumplings delicious! I know I may have been a bit critical with my dough issues, and will likely make some tweaks in the future (as simple as weighing the flour), but the resulting dumplings are absolutely fabulous! The beef filling is juicy and so flavorful. It's perfectly seasoned, and just excellent. These are not actually too spicy on their own, but the raw garlic sauce is super pungent and definitely elevates the spice factor. You could also add some of the chile sediment from your chile oil (if it's homemade chile oil) when you make the filling to make it spicier as well. Although I personally have some concerns about the dough recipe, it's simple enough to tweak by adding more flour, or using less water, to result in the proper texture. I have experience making dumplings from scratch, but am by no means an expert, and am still always improving and learning and developing new skills in my dumpling adventures. 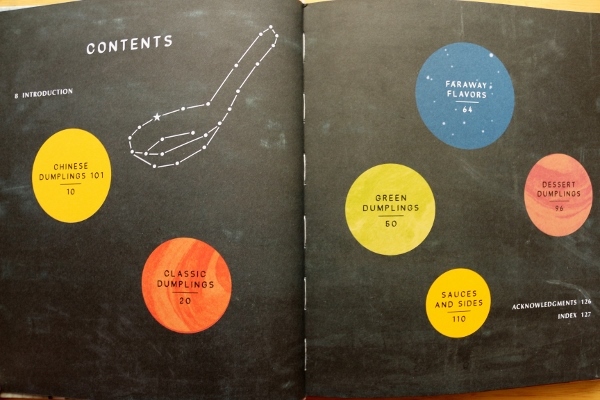 I am very pleased by the variety and detail in The Dumpling Galaxy Cookbook. There are several enticing fillings I look forward to trying, and am happy to learn some new techniques which will hopefully improve my overall dumpling repertoire. I've also learned a bit more about Northern Chinese style dumplings, which will further expand my dumpling universe. 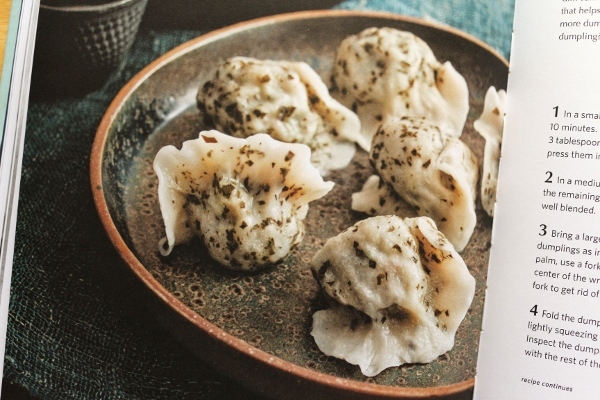 If you're an avid dumpling fan, this is another great cookbook to check out, particularly if you are a fan of The Dumpling Galaxy. I hope to visit Helen's restaurant on a future trip to Flushing's Chinatown. The recipe below uses the measurements in the book, but I've added a few notes in italics to share my own experiences in case you'd like to make adjustments on your own. Mix the dough. Add the flour to a wide mixing bowl and stir in the salt. Stir in the water and egg white with your fingers. The flour will look shaggy, like biscuit dough; as the dough comes together, run an open palm around the edge of the bowl and fold the flour into the center until it forms a rough clump (my dough was very wet using the original measurements, so I worked additional flour into the mixture until it was no longer sticky and gooey--probably an extra 1/2 cup or so). 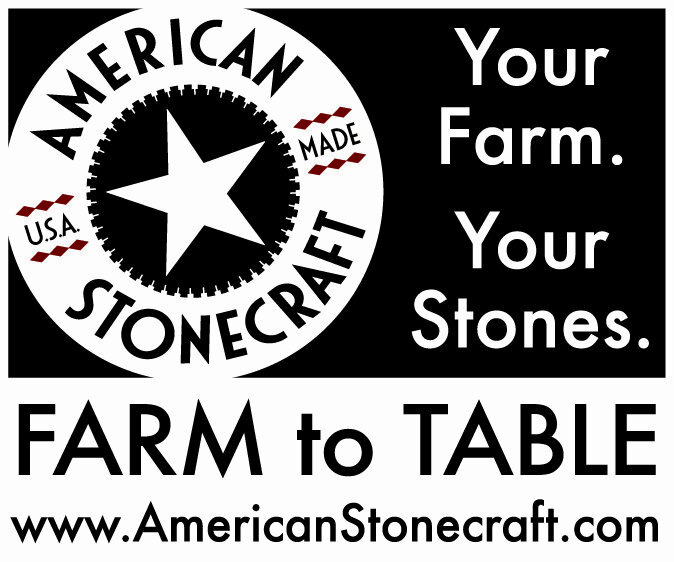 Coat your work surface with a fine dusting of flour, and turn the dough out of the bowl. Dust your hands with flour and knead the dough until it's smooth to the touch, not tacky, with no cracks or pockets of flour. Put the dough back in your work bowl, cover with a sheet of plastic wrap and rest for 15 to 30 minutes. While it relaxes, prepare your filling. In a medium skillet, heat the 2 tablespoons vegetable oil over medium-high heat until it starts to shimmer. Add the onions and cook, stirring occasionally, for 9 to 10 minutes, until they turn soft and translucent. Stir in the chile oil, then remove the pan from the heat and set aside to cool. 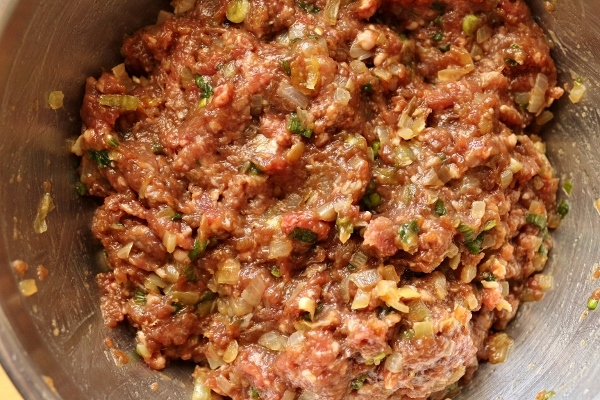 In a medium bowl, use your hands to combine the beef, scallions, soy sauce, oyster sauce, ginger, sesame oil, pepper, and salt, and mix until well blended. Gently fold in the onions and mix until fully incorporated. Lightly dust your work surface with a little more flour and remove the dough from its bowl. Gently knead it until you have a satin-smooth dough that forms a clean ball you can easily push into. Form your dough into a log, dusk a dough scraper with a little flour, and cut the dough into four equal sections (I usually like to work with the dough one quarter or at the most one half at a time, and cover the rest of the dough until I'm ready for it). Roll each section into a log and chop it into six pieces for a total of twenty-four balls of dough, each about an inch in diameter (I preferred cutting it into 8 pieces each, yielding 32 balls of dough). Toss the balls with a light coating of flour and cover with a lightly moistened towel. Gently smash the balls of dough into flat disks, then lightly roll and Asian-style rolling pin across them to flatten them out a bit more. Hold one disk by its edge and firmly but gently roll your pin from the disk's edge to its center. Roll the same edge a few more times, using more pressure at the edge than at the center. Use your other hand to turn the dough disk and reveal a new edge of the disk; roll again. Continue until all edges are rolled out and the wrapper is about 3 to 4 inches in diameter. Holding a wrapper in your palm, add about 2 tablespoon of the filling to the center of the wrapper, then lightly pat down the filling to get rid of any air bubbles. 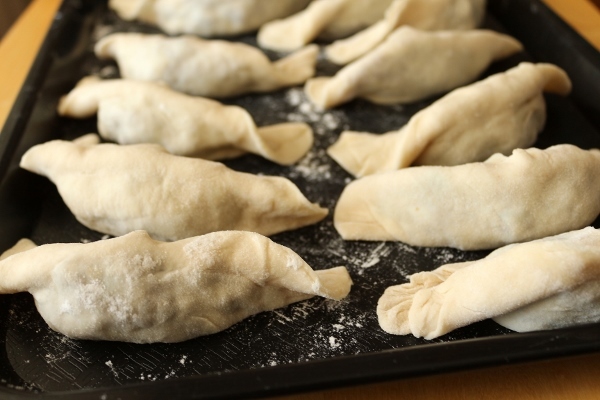 Fold the dumpling into a half-moon, pinching it shut with your thumbs and index finers, then press the center of the dumpling while pulling on the corners to push out any air bubbles and shape it into a curved crescent. Inspect the dumpling for any holes and pinch them shut. Repeat with the rest of the wrappers. In a small bowl, whisk together the flour, vinegar, and 1 cup of water until combined to make a slurry. Brush the remaining 1 teaspoon oil in a medium cast-iron or nonstick skillet and heat over medium-high heat, until the oil starts to shimmer. Add 6 dumplings with the sealed edges lying flat in the pan (I set my on their bottoms as opposed to on their sides), spacing them 1 inch apart, then slowly pour in just enough of the slurry to come one-third of the way up the dumplings. Partially cover the pan, leaving a small gap for steam to escape. Increase the heat to high and cook for 2 minutes for cast-iron (1 minute for nonstick). Lower the heat to medium for 2 minutes for cast-iron (3 minutes for nonstick). Then lower the heat to low for 2 to 3 minutes for cast-iron (3 minutes for nonstick) (in general I probably cooked mine a bit longer on medium because the bottom just wasn't browning enough--use your judgement). Cook until the water has evaporated, leaving a paper-thin disc of golden-brown starch on the bottom of the pan. Remove from heat and slide a thin, flexible spatula around the rim of the pan to loosen the edges of the starch disc, and carefully slide the spatula underneath and flip the disk onto a plate in one piece, crispy side up. 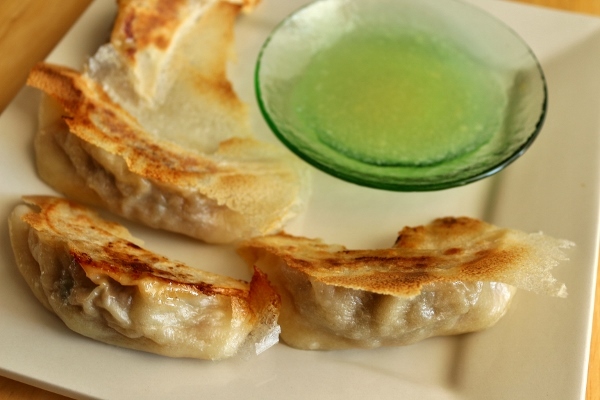 Serve immediately, then clean the skillet and repeat with the remaining dumplings. Serve immediately with the Raw Garlic Sauce, if desired. In a small bowl, whisk together the garlic, lemon juice, and 1/2 cup of cold water. Transfer to a glass jar or plastic container and refrigerate for 1 to 2 days to let the flavor mellow. Store in the refrigerator for up to a week.